VOORHEES, N.J. -- The question that seems to have surrounded the Philadelphia Flyers for decades was one of the prime topics again on the day the players cleaned out their lockers and got ready to start the summer. What will the Flyers do in net? Is Michael Leighton the answer? Will Brian Boucher return as the backup? Is the first goal of the offseason finding a veteran through free agency? A trade? 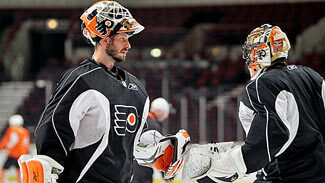 "I think Michael Leighton cost the Flyers $142,000 this year," Flyers general manager Paul Holmgren said. "I think it's fair to say that whoever our goalies are next year are going to cost a lot more than that." "I like to think I am (a No. 1 goalie). Obviously there's not too many goalies that make it to the Stanley Cup Final. We had a great team here. I just seem to click well with this team. They play well in front of me and I was doing well with them. I'm hoping I get an opportunity to stay here as the No. 1. If not, then elsewhere. We'll find that out in the next couple weeks." That's about the only certainty going forward concerning the Flyers' net situation, which saw seven players suit up and five play at least one game. Leighton ended the season as the starting netminder, and his remarkable play in late December and January is a major reason the Flyers were able to claw their way into the playoffs. He returned from a sprained ankle in time to replace an injured Boucher during their historic second-round comeback against Boston and backstopped the Flyers to within two wins of the franchise's first Stanley Cup in 35 years. After arriving off waivers from the Carolina Hurricanes on Dec. 15, Leighton went 16-5-2 with a 2.48 goals-against average during the regular season. His 2.46 GAA and three shutouts -- all the conference finals against Montreal -- led all postseason goaltenders. But he also allowed a number of soft goals during the final two games of the Final, including Patrick Kane's overtime Cup-winner. So is Leighton, a career journeyman who had been waived four times prior to his arrival in Philadelphia, ready to be a No. 1 goaltender? "That's a good question," Holmgren said when asked how he would evaluate Leighton, who can become an unrestricted free agent July 1. "I think we have to be careful there how we view him. I think Michael did an outstanding job for the team. I don't know if this is by design or not but I haven't watched the last goal. I saw it live and then I left the box. I haven't seen a replay of it. I've heard a couple guys comment on it, but I think it's unfair to view Michael in that way. I think he did some good things for us. Over the next 19 days I'll have a number of conversations with different people on my staff, from the coaches to the hockey staff, and we'll decide which way we're going to go." Leighton believes he's done enough to prove himself, whether it's in Philadelphia or elsewhere. "I like to think I am (a No. 1 goalie)," he said. "Obviously there's not too many goalies that make it to the Stanley Cup Final. We had a great team here. I just seem to click well with this team. They play well in front of me, and I was doing well with them. I'm hoping I get an opportunity to stay here as the No. 1. If not, then elsewhere. We'll find that out in the next couple weeks." If Holmgren consults his players, the replay will be nearly unanimous in their belief in Leighton. "I'm fully confident in him," captain Mike Richards said. "He carried us. He got us into the playoffs with the great stretches he had, and in the playoffs he was tremendous for us. I have a ton of respect for him. The situations we put him in, he battled through it. I'm fully confident that he's going to be there next year, and I'm fully confident playing in front of him. He' s played like (a No. 1). Seems like he's earned it." "You look at his numbers and it's an overwhelming yes," forward Scott Hartnell added. "He does everything a top goalie does to win." "He certainly played like (a No. 1)," defenseman Chris Pronger said. "I don't think you can fault the way he played this year. ... I think our team had been through an awful lot. We didn't play our best hockey leading up to his arrival and he kind of stepped right in and got hot for us. We needed that. We weren't playing very well, struggling in a lot of fronts. With his goaltending prowess over the month of January, we got our act together and rode him on a pretty good hot streak." Goalie coach Jeff Reese said Leighton's situation reminds him of Craig Anderson, who was a career backup until given the chance to start for the Colorado Avalanche this season -- and he helped them reach the playoffs one season after the club finished last in the Western Conference. "Time will tell," Reese told NHL.com. "Do I think it’s a fluke? No, I don't. I think he has a nice demeanor to him, some mental toughness." Leighton isn't the only option, however. Boucher showed down the stretch of the regular season and through the first round of the playoffs that he could be counted on. The club is also very high on Johan Backlund, who spent most of the season in the AHL. Holmgren said Backlund needs minor hip surgery, but that didn't stop him from re-signing 28-year-old Swede to a new two-year contract. The club also has developing youngsters in Jacob DeSerres, a 2008 third-round pick who helped the Brandon Wheat Kings reach the finals of the 2010 Memorial Cup; Adam Morrisson, a 2009 third-round pick who won 18 games for the Saskatoon Blades; and Joacim Eriksson, a 2008 seventh-round pick, who plays in Sweden. Beyond that, there is Ray Emery, who was signed last summer as the starter. He won 16 games and had a 2.64 GAA in 29 appearances, but he's trying to come back from a career-threatening hip injury. Emery will become an unrestricted free agent July 1, but Holmgren didn't completely close the door on a return. "We need to get medical information first," Holmgren said. "I don't know where that's at. Ray still has to have a follow up exam at Duke with the doctor that did his surgery. Once we get all that information, we'll see. I don't think that's something that's going to be answered until August or September, from what I can gather right now." There's always the trade or free agent route. Rumors at the trade deadline had the Flyers interested in Florida's Tomas Vokoun, and among the available unrestricted free agent goalies could be Dallas' Marty Turco, San Jose's Evgeni Nabokov and St. Louis' Chris Mason. "I don't think we're in a position to not look at anything and everything in order to get better," Holmgren said.